Commonspace.us helps you discover places you can reach quickly by walking, biking or public transit, add destinations to an interactive map, and share your plan with others. 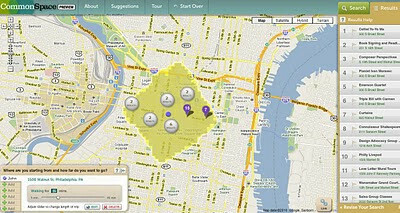 You can type in an address and then select your mode of transportation (Transit, Bicycling or Walking) a series of online to-do resources such as the Philly Fun Guide and Uwishunu are located on the right where you can select what type of activity you are looking for, for example finding a museum within a 15 walk or a nature trail within a 40 minute bus ride. You can also share this info with your friends and create itineraries. I did some test searches and found it to be very useful especially in Center City, when I tried to find destinations in the Far Northeast I came up empty. Fortunately you can suggest improvements to the product by providing feedback. I also suggested adding Google's bike layer and bike directions as well as combining walking and biking with transit as options.